The law in California is unambiguous: everyone must wear a helmet! 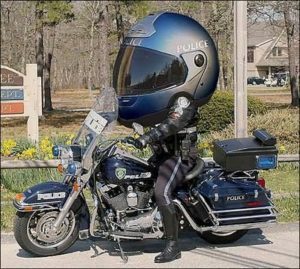 Although there there is anti-helmet law legislation currently pending, we strongly doubt that all helmet restrictions in California will ever be lifted. California requires a motorcycle helmet for all motorcycle riders and passengers. The helmet must fit properly, be strapped onto the wearer’s chin, and must comport with Federal Safety Standards. This law is found in the California Vehicle Code, sections 27802 and 27803. (a) The department may adopt reasonable regulations establishing specifications and standards for safety helmets offered for sale, or sold, for use by drivers and passengers of motorcycles and motorized bicycles as it determines are necessary for the safety of those drivers and passengers. The regulations shall include, but are not limited to, the requirements imposed by Federal Motor Vehicle Safety Standard No. 218 (49 C.F.R. Sec. 571.218) and may include compliance with that federal standard by incorporation of its requirements by reference. Each helmet sold or offered for sale for use by drivers and passengers of motorcycles and motorized bicycles shall be conspicuously labeled in accordance with the federal standard which shall constitute the manufacturer’s certification that the helmet conforms to the applicable federal motor vehicle safety standards. (b) No person shall sell, or offer for sale, for use by a driver or passenger of a motorcycle or motorized bicycle any safety helmet which is not of a type meeting requirements established by the department. (a) A driver and any passenger shall wear a safety helmet meeting requirements established pursuant to Section 27802 when riding on a motorcycle, motor-driven cycle, or motorized bicycle. (b) It is unlawful to operate a motorcycle, motor-driven cycle, or motorized bicycle if the driver or any passenger is not wearing a safety helmet as required by subdivision (a). (c) It is unlawful to ride as a passenger on a motorcycle, motor-driven cycles, or motorized bicycle if the driver or any passenger is not wearing a safety helmet as required by subdivision (a). (d) This section applies to persons who are riding on motorcycles, motor-driven cycles, or motorized bicycles operated on the highways. (e) For the purposes of this section, “wear a safety helmet” or “wearing a safety helmet” means having a safety helmet meeting the requirements of Section 27802 on the person’s head that is fastened with the helmet straps and that is of a size that fits the wearing person’s head securely without excessive lateral or vertical movement. (f) This section does not apply to a person operating, or riding as a passenger in, a fully enclosed three-wheeled motor vehicle that is not less than seven feet in length and not less than four feet in width, and has an unladen weight of 900 pounds or more, if the vehicle meets or exceeds all of the requirements of this code, the Federal Motor Vehicle Safety Standards, and the rules and regulations adopted by the United States Department of Transportation and the National Highway Traffic Safety Administration. (g) In enacting this section, it is the intent of the Legislature to ensure that all persons are provided with an additional safety benefit while operating or riding a motorcycle, motor-driven cycle, or motorized bicycle. If you or a loved one have been injured in a motorcycle accident and need a motorcycle accident attorney in Los Angeles, Orange County, Northern California, or anywhere in between, please call our toll-free hotline or send us an email.